Psymoon Records is proud to present Kapnobatai, a collaboration with Aum Sector from Greece. 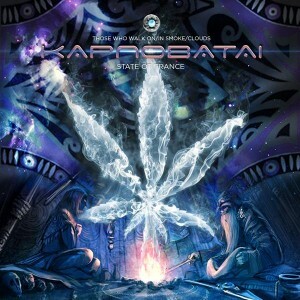 With a focus on fresh darkpsy, forest, and hi-tech psychedelic frequencies, this compilation pays tribute to the ancient Kapnobatai, shaman descendents of the Scythians who burned cannabis flowers to induce a state of trance. Mastering and artwork by Freekz Of Industry. MP3 Download | FLAC Download | WAV Download · Download count: 17,139. Viva o som da Floresta e os tecno-xamãs…..SUCESSO SEMPRE PARA O EKTOPLAZM! Great comp! As usual, Spagettibrain and Steganography deliver knockout tracks, as does Karakondzula. The Digital Abstract is another great track. Yes, the Fobi track has a little bit of a classic Goa feel to it, and I like classic Goa. Oh, and I forgot to add that I really like the M.Y. Project track; I just wish it was a bit longer. Thanks’ to making all keep IN trance! This release is epic if short of anything else to say!! Good flow!! Just keeps the ears glued up to the very last track!! Hope you guys come out with a release which involves Spiritual Dark vibes!! Would love to hear if one day you do decide to make one!! Not saying add mantras but you can just make spiritual tunes deep and dark!! Namaste from Bangalore!! Glad to be a part of it! Nice one! this is definately no hightech..
Crasy work, top tracks… great! Loved this from start to finish, thank you. Aliluja is heavenly bliss.